Broken Arrow Magazine's November 2004 (#96) issue just came out and it's another fine issue. 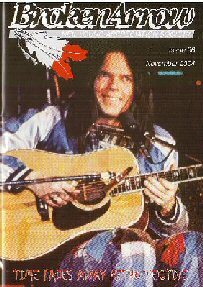 As usual, the Neil Young Appreciation Society magazine has lots of innaresting articles, including a fine remembrance on the passing of the Buffalo Springfield's Bruce Palmer by John Einarson. The cover article is a Time Fades Away Retrospective by Pete Long. It is without a doubt, the most extensive analysis ever published in Broken Arrow Magazine. Or for that matter, the most extensive analysis ever published on the Time Fades Away album and tour. The issue includes many never before published photos and stories from the era. I haven't made it through the 40+ page article yet, but already all sorts of unknown or forgotten nuggets have come floating up. Like the name of the Stray Gators being from Tim Drummond's touring with James Brown. When they were very drunk, it would be called "seeing gators." "The original album sleeve of the Time Fades Away vinyl album sleeve was printed on the reverse of black stock with the intention that the passage of time and normal wear and tear one would eventually see the images on the sleeve fading away -- a typical piece of Neil Young inventiveness." More on the first segment of Neil Young's Ditch Trilogy. A great issue! Just got mine in the mail. Loved those rare photos like the one on p 8 of the Stray Gators. Neil looks so cuddly! An "After the Gold Rush" Ripoff?